Here’s how to put a framework in place to regularly drive leads from your social media activity. 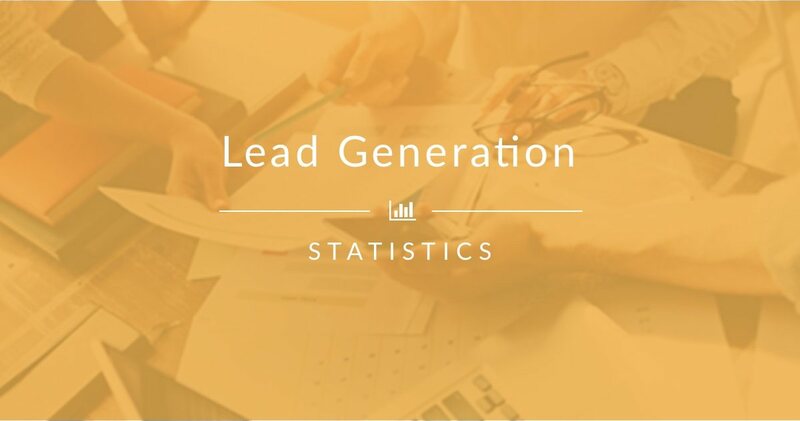 The first step to success with driving leads from social media is reviewing any existing efforts focused on lead generation. Understanding what processes are currently in place will help your team identify any opportunities where integrating social media would make sense. For example, if your organization typically attracts leads through blogging or an email newsletter then brainstorm how social media could best boost existing efforts with those mediums. Use social media to drive more attention to the articles on your blog that include a strong CTA or sign-up form as opposed to the content that’s purely educational. It’s a balancing act between providing value on social media, while also pushing your objectives. With a strong grasp of what’s happening across each marketing channel, it’ll be easier to see where social media can have an immediate impact. Ideally, this can help convince stakeholders that social media as a medium is a useful part of the lead generation puzzle. Next, consider which stages in the overall lead generation process are the best starting points for integrating social media in a meaningful way. When first generating leads with social media focus on attracting and converting leads, since closing leads on social media is unlikely and nurturing leads on social is a long-term effort. With these two stages in mind, all your initial efforts with social media lead generation should aim to attract and convert leads. As part of the attract stage of the lead generation process, it’s important to continually share valuable, entertaining and convincing information on your social channels for free. Low-touch content is information shared by your business that lives on social media or on your website that quickly provides solutions to issues your audience faces. A visitor isn’t required to sign-up or purchase anything to access this information, plus it shouldn’t take much of their time to consume the content since its highly actionable. The no strings attached access and the simplicity in which this content can be consumed is one of the reasons why it’s a starting point for building trust. 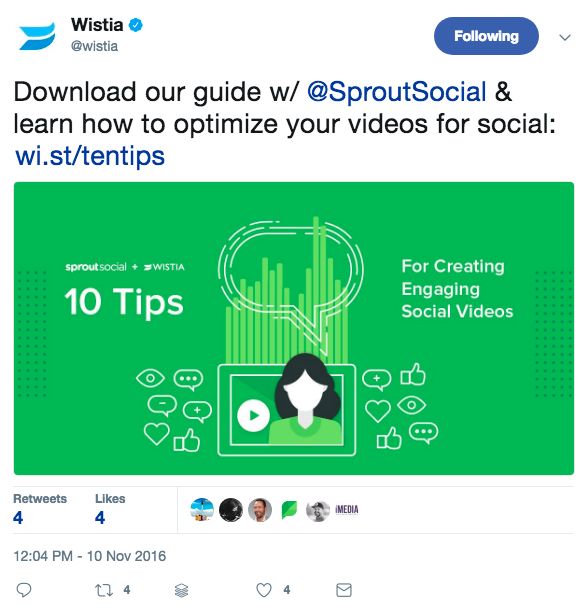 A blog post, a tweet with actionable advice or a short video are examples of low-touch content worth creating to serve your following on social media. Creating an ongoing rapport with your audience with low-touch content is important prior to asking them to download a lead magnet, sign-up for your newsletter or take action. “Ads, pinned posts promoting landing pages, CTA’s and more are all brilliant for lead generation, right? But, brands will usually flop in all the above unless they are sincerely social,” said Sam Hurley, a leading digital marketing influencer. “If you really want to be successful in attracting leads that convert into sales, start by investing resources into being responsive, engaging, caring, relevant and educational,” said Hurley. “Give your audience a compelling reason to trust, follow and buy from you. This is what I consider to be the governing strategy, above all,” he added. Don’t start a social media account for your company and immediately start promoting an eBook, in-depth resource or your offerings as that’ll be too pushy and off-putting. 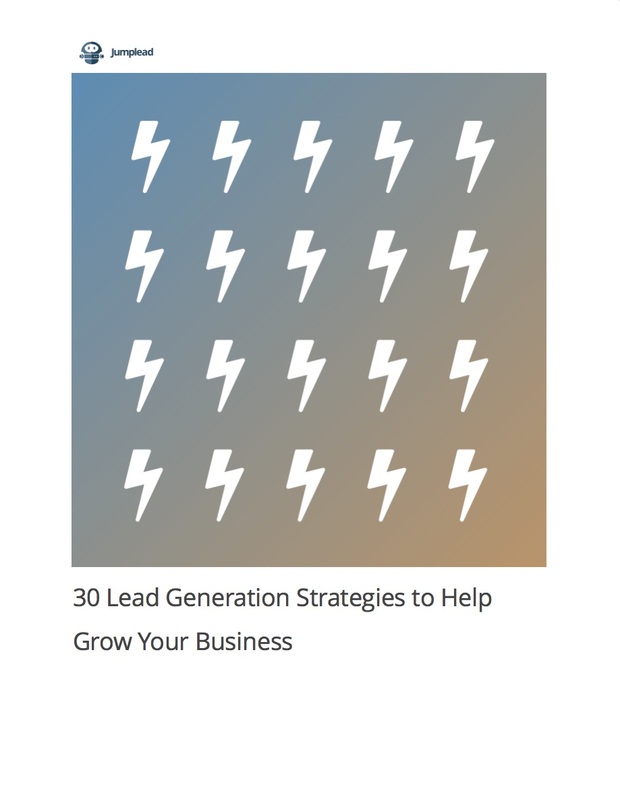 Although lead generation should be a primary focus on social media, it must be part of a greater mix to see long-term success with generating leads, building trust and cultivating relationships. Beyond sharing content that builds a rapport with your audience and is provided to them without asking anything from them, mix in the promotion of your most important lead magnets. A key part of the convert stage of the lead generation process, a lead magnet is a resource offered to your audience in exchange for their contact info and potentially other useful information about them. These resources are often gated with a signup form or a social login authentication that allows a visitor to provide their email or access to their social accounts to pull their info automatically. Once a person provides their contact info they get immediate access to the promised resource, tool, course or another type of lead magnet. Select a lead magnet and feature it prominently on the right social channels as part of a greater mix of content you’re sharing. This type of promotion is free, also known as organic, since you’re not paying for ads necessarily, but sharing the value of a lead magnet to your existing audience. It’s best not to share a post that simply says “Download our latest eBook today” as it doesn’t provide any context or explain how it benefits your target customers. Even though you’re not promoting your products or services, aggressively pushing opt-in content can still feel salesy. Instead focus the copy and any media included on the value the lead magnet offers and how a person can easily access it. Try being surprising, share what others have said about it after signing-up or talk about the exclusivity of the opt-in within the social post to drive interest. 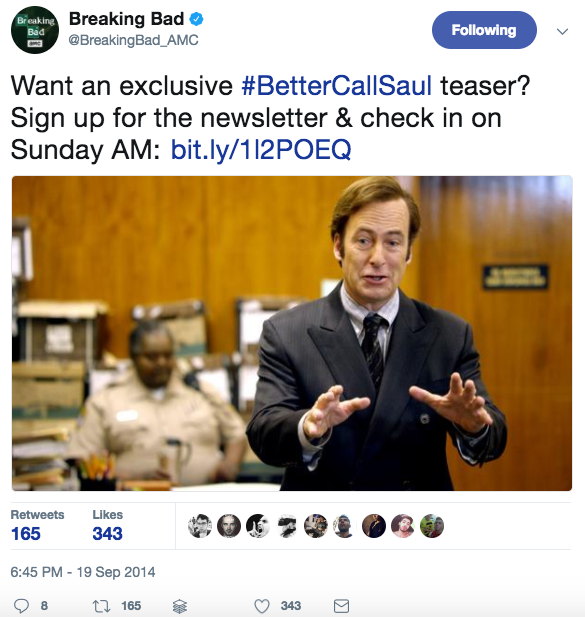 For example, AMC drove sign-ups to their newsletter by offering early access to the Better Call Saul teaser trailer, which super fans were excited to check out ahead of their peers. The copy is to the point and explains why it’s worth for a Twitter user to sign-up. 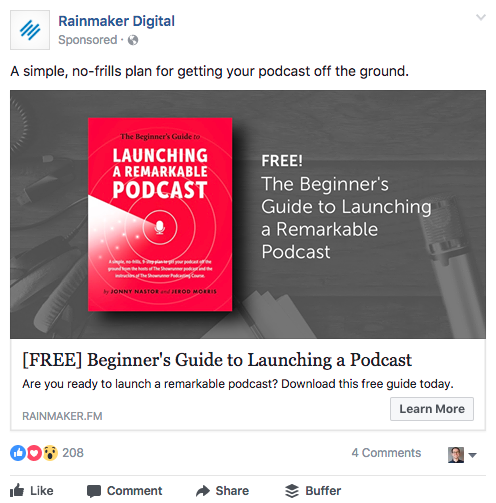 Here AdEspresso, a Facebook ads company, promoted a recently updated guide on their Facebook page by clearly describing what it’s about and why it is of value to readers. Try sharing a tweet or a Facebook post about a new whitepaper, giveaway or other lead magnet and pinning that post to the top of your profile. 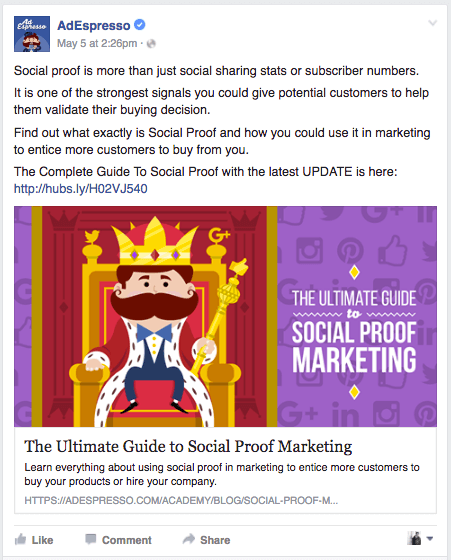 Promote a lead focused resource like an eBook by highlighting interesting quotes, useful facts, figures and stats that are included and feature them as part of your post. Start a live stream on Facebook, Twitter, Instagram or wherever your community spends time to discuss the lead magnet you’re offering and its benefits to your target customer. Build relationships with influencers in your niche on social media that’ll share and promote relevant lead magnets with their audience. Interview and include subject-matter experts within your lead magnets and then mention them on social media when sharing your resource to tap into their credibility and following. Develop a video for Facebook, Twitter, YouTube and elsewhere that explains the lead magnet, its benefits and what problems it helps a person solve. Cultivate partnerships with organizations in your industry, that don’t directly compete but serve similar audiences, to create and promote a joint webinar, white paper or course. This approach allows each company to reach a wider audience and share the leads driven by the collaboration. Think about the variety of features a channel has and the types of content that resonate on each when determining how exactly you’ll spread the news of your company’s lead magnets. Another way to drive leads is by hosting a giveaway, contest or promotion on social media. Considered a type of lead magnet, a contest entices consumers to provide their name and contact info to win prizes, early access to resources, meet an influential person and more. One of the most important considerations to keep in mind when running a giveaway for lead generation purposes, especially on social media, is ensuring that the leads generated are high quality. Often contests held on social media drive more leads than other strategies, but quantity doesn’t outweigh quality. Sometimes leads generated from a contest are low quality since people are looking to win an exciting prize, but don’t have any relevance or interest to your company. Counter this by offering a specific prize to your ideal customers that isn’t something random like an iPad but broad enough to have mass appeal to your larger audience. Another tactic to ensure you’re attracting quality leads is to require that each person fill out a form with a few fields or take action in order to participate. 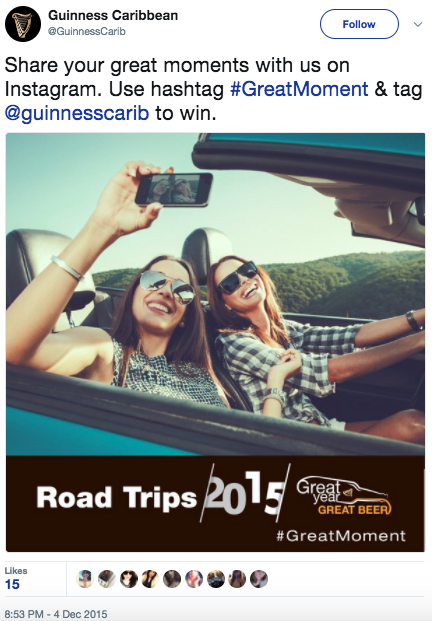 For example, Guinness Caribbean held an Instagram contest that required participants to share an image of their “greatest moments” paired with the campaign’s hashtag in order to be entered. Instead of simply sharing their email, participants had to take the time to share an image related to the focus of the campaign, which required more effort and was a greater barrier to entry. The goal is to strike a balance between reducing the people only signing up to get a free prize and making it simple enough for more of the right prospects to enter the contest. Another example is from Cisco, the B2B tech hardware company, who launched a challenge to encourage startups, entrepreneurs and developers active in the Internet of Things and the Internet of Everything space to submit their businesses and projects for review. The goal of Cisco’s campaign was to find companies innovating in the space and select the one’s with the potential to make the most impact in the industry. Winners would receive up to $250,000 in cash prizes to grow their business and mentorship from Cisco leadership and investors. 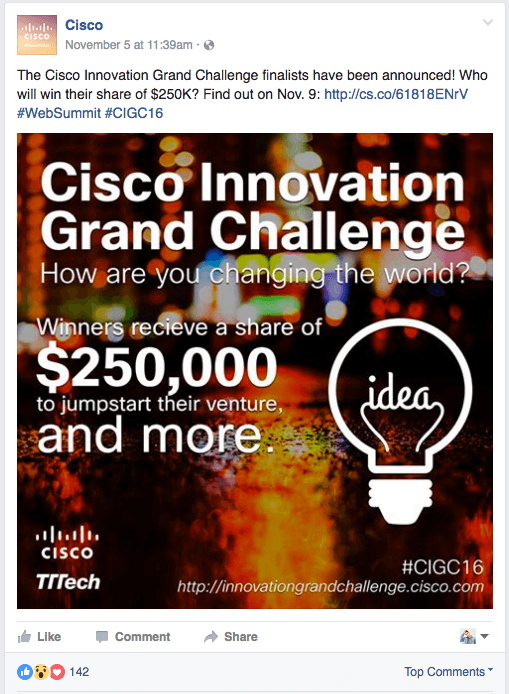 The campaign was widely promoted across Facebook, Twitter and Cisco’s other social channels resulting in 3,000 entries. It’s clear that not every business can make that much of a monetary investment into a contest to reach their goals, but it’s important to note how Cisco was able to collect thousands of high quality leads through the challenge. Duplicate the success of their campaign by coming up with a contest, promotion or giveaway that is highly relevant to your audience, the reward is greater than the effort needed to enter and provide value and excitement to all participants even if they don’t win. To reach a wider audience with your company’s lead magnets, dedicate a portion of the marketing budget to paid advertising on social media. “I've learned that with the constant algorithms updates to many social media platforms, paid ads on social platforms are the quickest and most efficient way to generate leads,” said Aaron Lee, the Regional Manager APAC at Agorapulse. Twitter, Instagram, Facebook and LinkedIn are effective channels for promoting your lead magnets with paid ads because users aren’t surprised to be served that type of content there. Pay attention to the lead magnets that perform the best on social media organically and on other marketing channels to inform which should be given additional exposure with paid ads. 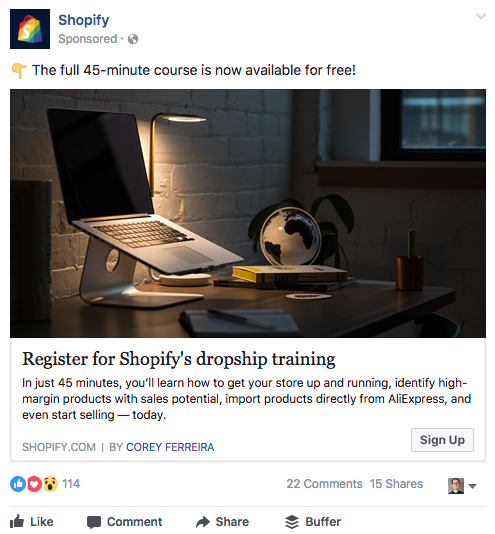 Here Shopify, is promoting a free course on how to do dropshipping on Facebook, which includes a sign-up call-to-action or CTA on the ad itself. This is likely a valuable resource to their audience of small business owners looking to continue to improve their website and grow their companies, which ideally will increase their flow of leads. Whether the ad is reaching members of their customer base, business owners unfamiliar with their company or both, the goal is to drive sign-ups to the course from the right types of people. The ability to target your specific audience with the right messaging is why social ads drive results, but social advertising can also remove major barriers to conversion. LinkedIn’s lead form ads and Facebook’s lead ads provide an optimized mobile experience and the ability for a person to complete a form by pre-filling it with info from their profile. Instead of having to fill out each field like their name, email, title etc., this information is automatically generated from their LinkedIn or Facebook profile with their permission. Here the popular daily newsletter theSkimm uses a Facebook leads ad to scale the number of sign-ups they receive per month, especially since there are fewer barriers to subscribing. For continued success with lead generation using Facebook lead ads, create a lookalike audience and target them based on who converted previously. 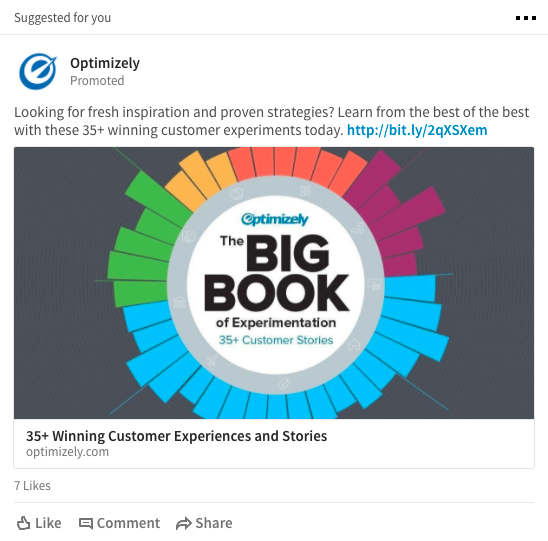 From LinkedIn to Facebook there are multiple ad units to consider using and a variety of ways to target your audience based on the focus of your lead magnet. When first starting with social advertising, dedicate a small budget between two to three different campaigns to test which channels and types of ads drive results in your vertical. For the best outcome, adapt your approach to lead generation based on where your customers are active on social media. Here are a few social channel specific strategies for capturing leads. Lead Ads: Available on Facebook and Instagram, lead ads allow businesses to capture contact info from users interested in your products, promotional offer, contest or lead magnet. 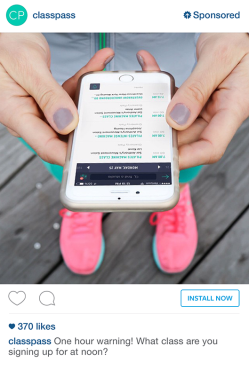 To ensure your Instagram advertising campaigns connect with consumers and stand out in their feed for the right reasons, include highly visual media with your ads to match user expectations. Video Ads: Video is one of the most widely circulated types of content on Facebook and elsewhere online because it’s a useful medium for telling a compelling story. When creating a video ad for Facebook select one of the following ad objectives to include a CTA button with the video to best capture leads: Website Clicks, Website Conversion, App Installs, App Engagement, Local Awareness, Brand Awareness or Video Views. Host a Facebook or Instagram Live Training: Beyond hosting an interview, behind the scenes or the traditional live stream, conduct a 10-30 minute training session on a particular subject that’s announced ahead of time. It can act as a preview of a webinar or have a CTA at the end to drive viewers to purchase a product, subscribe to a newsletter, download a course etc. Lead Form Ads: Simplify the process of capturing leads from LinkedIn by featuring your top lead magnets in a lead form ad. The lead magnets most likely to perform when featured in these ads are newsletter sign-ups, white papers, case studies, eBooks and webinars. Create and Repurpose Foundational Content: To fuel your lead generation efforts year round, develop one in-depth piece of content, called the ‘big rock’ by LinkedIn as seen in blue. This foundational content should be focused on the needs of your customer base and include both new research and information curated from relevant sources. Repurpose this foundational content into other formats (as seen in green, red and yellow) throughout the year to be featured across your sponsored updates on LinkedIn, posts on your company page and elsewhere. Publish on LinkedIn: Have company leadership create original content for publishing on LinkedIn and syndicate articles published elsewhere to engage their network. Add a CTA in the middle and/or end of the articles shared on LinkedIn to drive subscribers to your newsletter, webinar sign-ups and more. The CTA should be a distinct link included within the text, but shouldn’t be overly disruptive to the reader’s experience. Craft Lead Focused Tweets: To drive leads from Twitter, craft tweets that are focused on a single topic, include one clear CTA with a link, a memorable image and captivating copy. Remove all distractions from lead generation focused tweets like additional links, mentions, photo tags and hashtags to avoid sending a person anywhere else but your landing page. Use Website Cards: The ad offering from Twitter most aligned with a lead generation campaign, website cards allow a business to drive users to a landing page on their website. 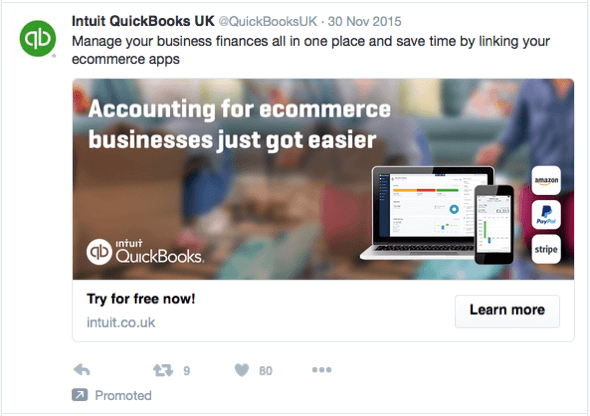 It’s also simple to add conversion tracking with this type of ad to measure lead growth off of Twitter. 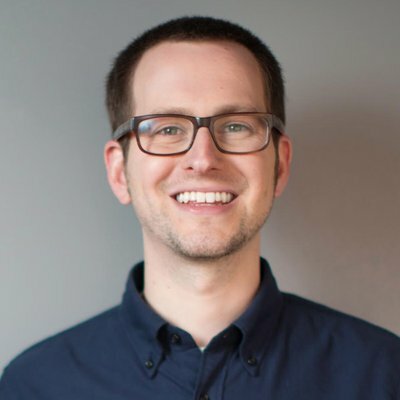 Create a Twitter Specific Landing Page: To increase the conversions driven by your lead generation focused tweets, create landing pages that align with the messaging included in those tweets. When this messaging is coordinated between each touchpoint in a person’s interaction with your organization, it increases the likelihood that they’ll convert. Building a community for your organization on social media is beneficial, but only if you’re able to convert some of your followers and visitors into leads. Beyond driving awareness and conversation with your audience, social media can help generate qualified leads for your business. According to Struto, social media lead conversion rates are 13% higher than the average lead conversion rate. The primary reason this is the case is because social media is useful for creating trust between a business and its audience, which makes it easier to get their permission to access and collect their personal data. Unfortunately, most marketers and business owners get distracted by the bells and whistles that come along with social media like building an audience and driving interaction for the sake of it. The media and industry competitors tend to exaggerate the wrong aspects of social media for business, confusing where a company’s priorities should be. Developing audience growth and engagement are important facets of a company’s social media use, but should be secondary considerations for B2B organizations as compared to collecting leads, retain existing customers and driving sales. To realign your company's priorities with social media, develop a systematic framework for capturing leads across different social channels. With a clear process in place it’ll be easier for your team to repeatedly test a variety of strategies to see what generates leads.